Here’s a vegetable dish to hold dear in recipe file. Turnips and squash have never tasted better than in this stew from Morocco, fragrant with cinnamon and saffron. The older kids devoured it. The little ones not so much. But they all got a huge kick out of cutting up all the vegetables and I can enthusiastically recommend this as a family project. There are many ingredients, but the degree of difficulty is very low. And in the end you have a fabulous, extremely healthful feast to spread on the dinner table. In Morocco, as in our country, the number seven is considered lucky. 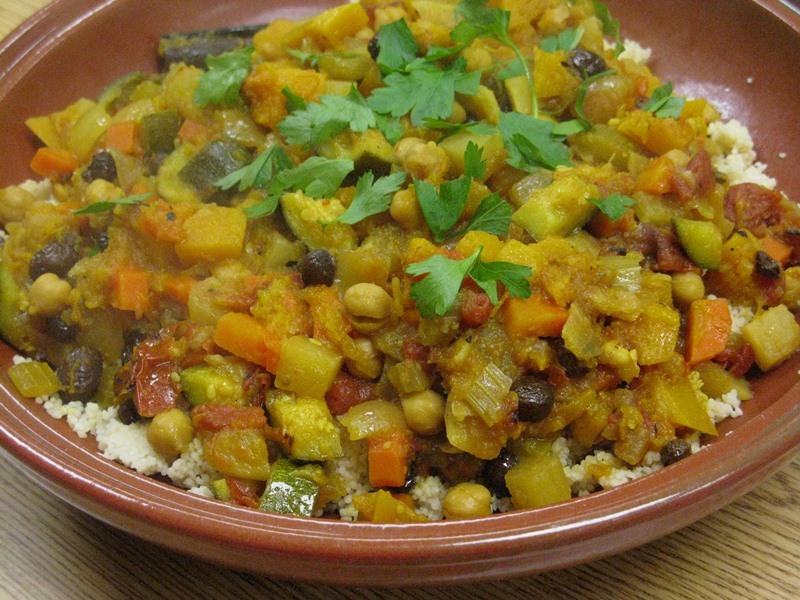 That helps account for the number of vegetables in this dish originating from Fez, Morocco. I’ve adapted the recipe from one in Paula Wolfert’s classic Couscous and Other Good Food from Morocco. So you won’t need to make a broth from lamb shanks and beef chuck and chicken wings, as Wolfert suggests. Some recipes we simply must shorten because we only have one hour to teach our food appreciation class. We also cooked our stew in an ordinary pot, rather than in the traditional couscousiere, a kind of stove-top device in which fragrant meats and vegetables cooking in broth are used to steam and flavor the couscous. It’s widely assumed that couscous is a type of grain. It looks a bit like amaranth, and the kids equate it with rice. In fact, couscous is a wheat product that’s first made into a kind of pasta, then chopped into tiny bits. It rehydrates easily. Rather than steaming it in the traditional manner, we simply measured 1 1/2 cups into a mixing bowl, then covered it with boiling water to a depth of 1/2 inch. Cover the couscous with a pot lid that fits inside the bowl and set the whole thing aside while you prepare the stew. For the stew, you’ll need 1 large onion, 1 large carrot, 1 large stalk celery, one medium turnip, 1/2 small butternut squash, all peeled and trimmed as needed and cut into bite-size pieces. In a heavy pot over moderate heat, heat 3 tablespoons extra-virgin olive oil and add the onion, followed by the rest of the vegetables as you cut them. Season generously with salt. Stir in a handful of raisins, 1/2 14-0unce can chickpeas (garbanzo beans), 1/2 14-0unce can diced tomatoes (or substitute fresh, peeled tomatoes), 1 stick cinnamon, a generous pinch saffron threads, 1/2 teaspoon turmeric, a small fistful of parsley sprigs, and 1 cup chicken stock (or vegetable broth if you want to keep this vegetarian). Bring the stew to a boil, then reduce heat and cook gently until the squash is almost cooked through, about 20 minutes. Add 1 medium zucchini, trimmed and cut into bit-size piece, and cook an additional 10 minutes or so, until the zucchini is cooked through. Use tongs to remove the parsley and cinnamon stick. Dump the couscous out of the bowl into your favorite display dish. You may need to break it up and fluff it before pouring the pot of stew over it. Garnish with chopped parsley. This recipe looks delicious! I’m glad that your kids were so accepting of different flavors. I’m an editor at Prevention.com, and we’re always looking for tips to get children to try new and healthier dishes. Great ideas! Mara, say hello to Maria Rodale and Dana Blinder for me.